Emergency Dentists USA has done all the work of finding the best emergency dentists in Irvine, CA for you, simplifying your search and saving you time and energy. We have a comprehensive list of emergency dental clinics that offer after-hours care so that you do not need to skip work to get your dental emergency taken care of. With a quick phone call to the Emergency Dentists USA hotline, you are connected to a friendly operator who can help you choose the best emergency dentist in Irvine, California to fix your broken tooth, lost filling, or painful toothache. When you have a dental emergency, we here at Emergency Dentists USA have everything you need right online. I am very glad I found this website and was able to call the super helpful staff at Emergency Dentists USA. They helped me figure out my dental problem and found the perfect dentist to fix it, all within minutes! In Irvine, there are a few different emergency dental clinic options. The emergency dentist at 7 Day Dental has late office hours Monday through Thursday until 8 pm and weekend hours until 5:30 pm. Art of Dentistry stays open until 6 pm four days a week. Irvine Dental Group has late hours on Wednesday and stays open until 2 pm on Saturday. Oc Dental Specialists offer appointment only weekend hours to help those with an emergency that may arise last minute. Irvine is a wonderful place to work and live and they have many great dental clinics to meet your needs should you have a dental emergency. Emergency Dentists USA is your source for quality emergency dentists in the Irvine area. Our 24-hour emergency helpline is there to link you to a person to help you find just the right Irvine emergency dentist. Description: During your visit to Irvine if you fall prey to a dental emergency, you will definitely not be enjoying what the city has to offer. Once extreme pain sets in, call our phone number 24/7 and get linked up with someone to make sure your teeth stay healthy and intact. Description: Their purpose at 7 Day Dental remains the same since the day they opened: the treatment and prevention of oral disease through providing the finest dental care to as many patients as possible, regardless of their means. On top of all dental services they provide, 7 Day Dental is also well known as an emergency dentist for the Orange County area that is open 7 days a week. Dentists: Dr. Nina Sharma, Dr. Arman Mirai, Dr. Joseph Yang, Solomon Poyourow DDS, German Trujillo DDS, Mark Weisenberg DDS, Ali Manouchehri DDS, Andrew Tibbits DDS, Joseph Packer DDS. Description: OC Dental Specialists is one of the premier dental practices in the Irvine area. You will find that they have ten different doctors (4 specialize in general dentistry, 1 periodontist, 2 oral surgeons, 1 orthodontist, 1 pediatric dentist and 1 endodontist.) So, to say that you are in capable hands with OC Dental is an understatement. Their site is easy to navigate and puts the focus on you. Their hours are very flexible and they even offer appointments on weekends which is ideal for someone who has an emergency. Description: This full-service dental facility is most happy to attend to your dentistry needs as your after-hours dentist Irvine, CA facility of choice. They offer the latest in state of the art technologies and focus on providing affordable, quality emergency dental services which include advanced digital x-ray machines, treatment rooms outfitted with multiple media information centers. Description: Dr. Emil Hawary is a top-notch dentist serving the Orange County area and providing emergency dental services for Laguna Beach, Costa Mesa, Tustin, Newport Beach, Laguna Hills, Laguna Woods, Huntington Beach, Corona Del Mar, Lake Forest, Santa Ana, San Clemente, Dana Point, Beverly Hills, and Long Beach. A visit to your Irvine emergency dental clinic is similar to visiting your regular dental clinic. They offer the same services but have the hours you need when you need them. – When you visit your Irvine emergency dentist, you will want to have with you all of your paperwork such as your health records and insurance information. – Be certain to arrive early to your appointment to fill out any required paperwork and ask any questions you might have about your procedure. – Most accept payment in the form of cash, credit, and insurance, but you want to be sure before you arrive. Ask if they accept your specific dental insurance plan as well. – Tell your emergency dentist about any allergies you have. Bring with you a list of all your current supplements and medications to your visit. Common 24-hour dental emergencies might include things like a broken tooth, lost crown, or a painful toothache. Other common dental emergencies include a knocked out tooth, loose braces or wires, or even a dangerous abscess. An Irvine emergency dentist is there to handle all of these emergencies with prompt treatment, preventing the emergency from becoming worse than it already is. An abscess can be an extremely painful infection that occurs around the root of a tooth or it happens around the space between the gums and teeth. 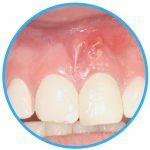 An abscess is a serious condition that causes damage to the teeth and tissues around the area if left untreated. The infection can even spread to other parts of the body if not treated promptly. It is important to get an appointment with your Irvine dentist as quickly as possible if you suspect you have an abscess. An abscess can look like a small pimple on the surface of the gum. To ease the pain while you wait for your appointment, you can rinse your mouth using a mild salt water solution several times a day. To make the solution, add 1/2 teaspoon of table salt to an 8-ounce glass of water. 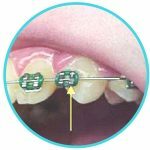 Broken braces, bracket, or wires can cause damage to your mouth if they are poking at your cheek, gum, lip, or tongue. It is important to try to reposition the piece by using the eraser end of a pencil to push the wire into a more comfortable position. If the piece can not be repositioned, you can cover the end using a bit of orthodontic wax, gauze, or a bit of cotton ball until you can get into your Irvine emergency dentist. Do not try to cut the wire as it can cause further damage if you should swallow or breathe it into your lungs. 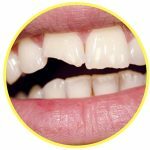 A chipped or broken tooth is a horrifying and potentially traumatic experience. The first step you should take is to save any pieces that you can find. Rinse your mouth and the broken pieces using warm water. If your mouth is bleeding, you can apply a piece of gauze to the area for around 10 minutes to stop the bleeding. A cold compress to the outside of the mouth near the broken tooth helps reduce swelling and relieves pain. Contact your emergency dentist and secure an appointment as soon as possible. An emergency tooth extraction can be a scary thought for any person. They are the last resort in most instances as the dentist tries everything first to save a tooth, but on occasion, an emergency tooth extraction is absolutely necessary. This is the case when an infection is too far gone, the tooth is broken to an extreme extent, or disease has ruined the tooth. The dentist will give you anesthetic to numb your mouth and this will remain for a few hours after the extraction so it is important to not eat during this time as you could damage your mouth by biting it. Once the area is completely numb, the dentist will remove the tooth and place a gauze pack on the extraction site. The gauze limits the bleeding and helps in the healing process. Once the blood clot forms, it is important to do nothing to dislodge it. During the next 24 hours do not rinse your mouth vigorously, spit, drink through a straw, or engage in strenuous activity. Limit alcoholic beverages and smoking during this time. Brush and floss your teeth the next day, being careful to avoid the extraction site. Take any prescribed medication as directed. To help with pain and reduce swelling, a cold compress can be applied to the outside of the affected area. If you should have fever, vomiting, severe pain, or bleeding, contact your Irvine emergency dentist right away or go to the emergency room. Most dental emergencies can be efficiently handled by your Irvine emergency dentist. They are trained to handle any dental emergency that arises. Toothaches, broken brackets, and knocked out teeth are all emergencies that your emergency dentist can and should handle. When a tooth is damaged due to a traumatic accident such as a sports injury or car accident, the hospital emergency room is where you need to go first. While they are not trained to handle dental emergencies, they can be certain that you do not have any broken bones or other injuries that could complicate your care. They are able to do x-rays and provide you with the appropriate medications to meet your needs. The emergency room is also the place to go if you should not be able to get into the emergency dentist when you need one. Once they have treated you, they will refer you back to an emergency dentist to handle the tooth injury. Always check with the local dental society to ensure that the dentist that you choose is certified and licensed in Irvine. The American Dental Association website can be used to check dental licensing information. 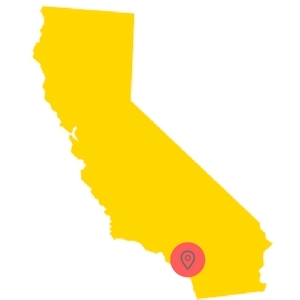 You can find certification and licensing on the California Dental Association website. The websites offer information regarding Irvine emergency dental clinics and are designed to help you make an informed decision. Should you have a dental emergency and not be able to reach an Irvine emergency dentist, you should call 911 or proceed to the nearest hospital emergency room for medical treatment.